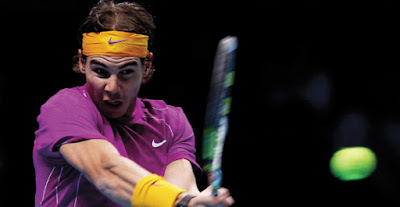 In this article by the Atlantic Magazine, author Josh Speckman explains the physics behind Rafael Nadal's incredible spin potential and how technology has taken modern tennis to a completely different dimension today. Check out this video about the Science of Spin in Tennis (with footage taken from the ITF). There is also an excellent video that shows this "snap back" effect of polyester strings. "Co-polyester" strings such as the acclaimed Cyber Flash and Cyber Blue strings are merely poly strings coated with special lubricants that allow the string to slip and slide back into place after contact. They propel the ball with a recoiling snap effect while maintaining the durable characteristics of polyester. Great article! Slow motion video really shows the strings springing back into place. I just wishing stringing polys were not so hard to weave the crosses!